Zeiss Otus 85mm f1.4 Apo Planar T* Canon ZE and Nikon ZF.2 mount lens reviews: World&rsquo;s best performing 85mm portrait lens? One of three new lenses announced as part of Sony’s new no-compromise G Master series for full-frame a models, the new FE 85mm f1.4 GM sounds highly promising. Though it carries a hefty price premium — the new model will set you back close to $1,800 — it features cutting-edge optical technology. 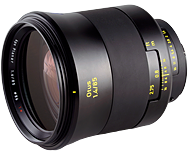 Carl Zeiss’s latest range of Batis lenses has been specifically designed for the Sony A7 series of full-frame mirrorless cameras such as the Sony A7R II and Sony A7S II. Together with the legendary optical precision and outstanding build quality for which Carl Zeiss lenses are known, the new Batis lenses also feature autofocus and an innovative OLED display on the lens barrel that gives both focus distance and depth-of-field information. The first new lenses released in the Zeiss Batis lineup are the 25mm f/2 wide-angle prime and 85mm f/1.8 short telephoto prime. Retrouvez dès à présent les premiers résultats de tests, réalisés en partenariat avec DxOMark, du nouvel Otus 85 mm f/1,4 de chez Carlz Zeiss : présentation, transmission, vignetage, aberrations chromatiques, acutance et exemples images (Carl Zeiss). Alors, ce nouvel Otus est-il au niveau du 55 mm f/1,4?